Here's tt's pumpkin, carved up by Bessie. 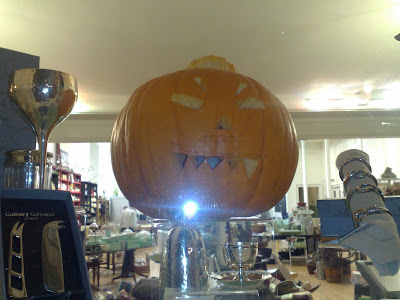 There's a bit of a pumpkin theme going on in the cafe menu this Saturday, 31st October. Also it's the last day to see ThornhillArts' 5 x 5 exhibition. It's worth a look and has been getting a good response from customers. Definitely a Halloween treat. Hugh Bryden is unveiling the new work he has created for his Summer at Home exhibition this coming Saturday (August 29th). And Hugh will be also holding print demonstrations and launching his new artists book collaborations. Hugh is used to spending summers in warmer climes searching for inspiration. But staying at home in Dumfriesshire and spending time with us for one of the wettest summers in memory hasn’t dampened his spirits. Indeed, two of the works Hugh has created for the exhibition Summer at Home capture this summer’s dominant weather theme: Blustery and Solway Rain. Hugh has also created new works featuring well-known local sites and areas of beauty including: Kirkcudbright Tolbooth; Thornhill Cross; Powillimont Shore; Mennock Bridge and Devorgilla’s Bridge. Print involving poetry is this Saturday’s theme. At 11am and 2pm Hugh will be showing how to create Poetry pamphlets—combining writing and simple bookbinding. 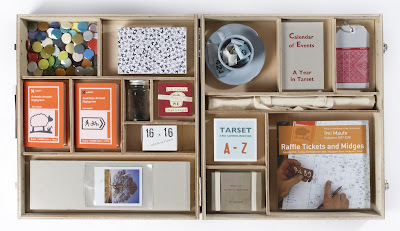 And at 3pm—Hugh will launch both of his new artists books. His collaboration with writer Chrys Salt entitled Old Times, and the other collaboration --Devorgilla’s Bridge --with poet Hugh McMillan. Both Hughs will read excerpts from the poetry pamphlets. All the events are free, and you are very welcome to join us. Our artist in residence Hugh Bryden will show you how you can create prints in the comfort of your own home this Saturday (22nd August). Hugh is holding the printing demonstrations at 11am and 2pm. And entry is free. Hugh will be showing customers a range of printmaking techniques that can be carried out in the home without specialist equipment. Hugh is also exhibiting new work created as part of his exhibition: Summer at Home. The exhibition’s been running here at Thomas Tosh for the past three weeks. The new prints of local scenes include: Devorgilla’s Bridge ; Penpont; Kirkcudbright, Castle Douglas; Thornhill and Mennock. It is all part of Hugh’s mission to completely change his exhibition by the end of its run. And next Saturday (29th August) we will be celebrating the launch of the new work here at Tosh and you are welcome to join us. The exhibition finishes on September 5th. 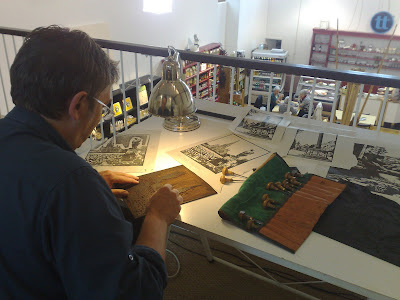 Hugh will be holding two more Saturday workshops, and will be at TT every Tuesday as well. Award winning publisher and printmaker Hugh Bryden is holding a free workshop at Thomas Tosh today (Saturday 8th August). Hugh will be showing customers the techniques of how to make simple books, such as accordion structures. He uses these techniques himself in his artists books. Hugh will be at Thomas Tosh from 10am onwards and you are very welcome to drop in at any time. Hugh's first week as artist in residence at Thomas Tosh has been going well. He's produced the first print proofs of linocuts whilst he's been here. The prints are of local scenes: Penpont's war memorial, the cross at Thornhill, and Mennock Bridge. 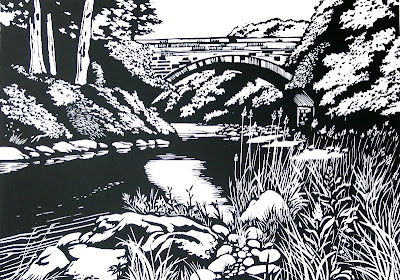 They are great depictions of familiar places, which haven't been portrayed in linocut before. Hugh has created strong, fresh images--with twists you'd expect from this award-winning printmaker. For example, there's the barbed wire running along the wall behind the war memorial in his Penpont print. That's a literal representation of what you see, but you'd probably miss it if you visited the memorial. Hugh's work makes this echo of the trenches stand out. Hugh will be holding more workshops later this month, and will be at TT every Tuesday as well. The gallery page has more details. Summer is in full swing at Tosh. The Vanishing Scotland exhibition was launched this week and has been sparking a lot of local interest. We will be updating the blog about events linked to this exhibition. 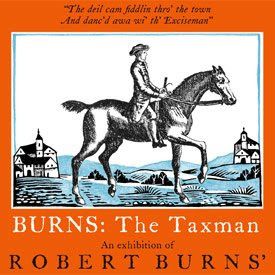 And Burns: The Taxman is back at Tosh until the end of the summer as well. There's a couple of other things that will hopefully whet your appetite. JoAnne McKay is launching her new poetry collection The Fat Plant at TT on Sunday July 12th at 3pm. JoAnne's recital is worth catching as she delivers her readings extremely well. The Fat Plant has various themes including JoAnne's experiences as a police officer. But her family background dominates and provides rich insights into life. And then in August, printmaker Hugh Bryden is launching Summer at Home, which ties in with Homecoming 2009. Hugh will be running workshops in printing and bookmaking. And his exhibition will change during its run to reflect a summer in Dumfriesshire. Thomas Tosh was the lunchtime refuge for a group of cyclists from the Lloyd's Cycling Club today (Wednesday 10th June). They're on the Scottish leg of their charity ride from Land's End to John O'Groats. Good luck to them, only another 350 odd miles of saddle soreness until they get to John O'Groats. The Nith Landscapes exhibition is entering its final full week. And we've got a couple of special events tied in with it. This coming Saturday (6th June), Ed Slater will be revealing his trade secrets by showing customers how he creates his pictures. Ed's bringing in canvases that he is currently working on to reveal the different stages in the creation of his amazing pieces. Ed's pieces are multilayered, using acrylics, glass paint and found objects. They've raised a lot of interest at the Nith Landscapes exhibition. So his talk should be fascinating insight his work. Ed will be at Tosh from 3pm on Saturday and entry is free. And fellow exhibitor Fiona Allardyce-Lewis will be running our first paid entry workshop next Thursday (11th June). Fiona has been inspired by the arts and crafts legend William Morris for this workshop. And particularly his vision encapsulated in his famous quote: "Have nothing in your house that you do not know to be useful, or believe to be beautiful." Fiona's keepsake boxes and mirrors have lots of buyers. She manages to combine technical skill, mastery of perspective and humour to create distinctive pieces of art. In the workshop, Fiona will be helping customers create painted placemats or coasters that will be theirs to keep. 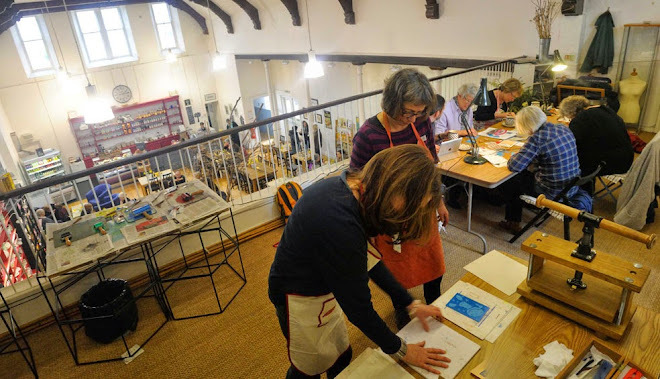 The workshop runs from 10am to 5pm and it costs £35. 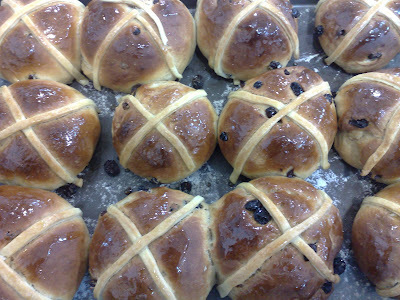 That includes all materials, lunch and morning and afternoon tea/coffee and cakes. Fiona says: "I've run workshops for young people before, but this is my first workshop for adults, and I'm really looking forward to it." Ed Slater will be chatting to customers about his amazing art work this Saturday (30th May,2009) at TT from around 1pm. Ed's work needs to be seen in the flesh. It always intrigues customers here and gets lots of admiration. He builds up his paintings with acrylic and glass paint and found objects. Ed will be exhibiting at Tosh for two more weeks as part of the Nith Landscapes exhibition. 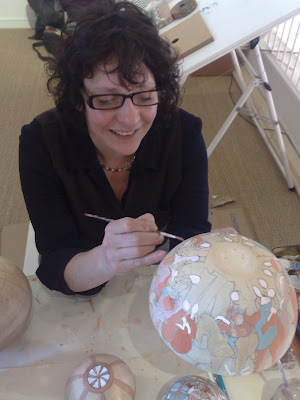 And as part of the exhibition we are planning a workshop to be run by another exhibitor, Fiona Allardyce-Lewis. I'll post those details as soon as we have it all worked out. 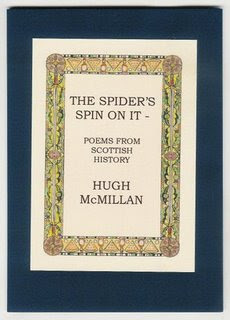 Local poet Hugh McMillan is at Thomas Tosh this Saturday (9th May, 2009) reading from his new poetry collection The Spider's Spin on It. He will be here from 3pm. 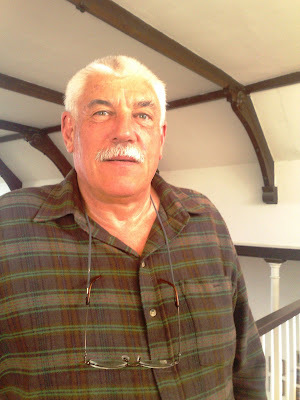 Hugh's poetry is great, you get a range of different tones --some poems are serious and sublime, others make you laugh out loud; all are thought provoking and shine through with Hugh's love of history (he's a history teacher at a school in Dumfries). Hugh's knack is to get you into the minds of the knights, the soldiers' wives and even insects of history. The Spider's Spin on It of the title is the spider's view of its legendary encounter with Robert the Bruce. It's hilarious. And this is not just Thomas Tosh's house view. Hugh has won prizes and Scottish Arts Council backing for his poetry. So it's official. The book itself looks really special and is a collaboration with Dumfries-based printmaker Hugh Bryden, who is exhibiting at Thomas Tosh in August. Melville's featured in an article that the Dumfries & Galloway Standard is running today. Melville will be at Tosh tomorrow, Saturday (25th April 2009), from 11ish to mid afternoon. We're also launching a quiz and activity pack for children tomorrow, which is linked to Melville's exhibiton. It's free as is admission to the exhibition. We've got a new jewellery line in at Thomas Tosh, and it's created by Susannah Goodyear who lives in the area. Susannah's work is fantastic and different in style from the other fine jewellery lines we have. 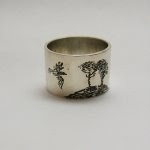 She works in silver and steel, and is inspired by both nature and the natural curiosities you can stumble across in museums. We've our own curiosity cabinet of Susannah's work including rings, earrings, and a very strange bird like creature. So come and take a look. Melville Brotherston will be at Thomas Tosh this coming Saturday (11th April 2009) from 11 am to about 2.30pm to talk to customers about his new exhibiton True Colour. Please feel free to pop in and chat with him. Preview night on Tuesday 31st March (2009) brought a good crowd and Melville won admiration for his new work, especially the landscape pieces of nearby Cairnshead. His paintings Glory of Autumn and Road to Cairnhead are proving big favourites in this exhibiton. Melville's animal paintings are always popular. And Hoopie (featuring a poor cockerel that is only happy using one leg) and Highland Bull in Winter have gone down a treat. Melville also came in on Saturday (4th April 2009) to meet customers at tt and talk about his work. And he plans to do so again in coming weeks. I'll post the details as and when. True Colour continues until May 16th and you are very welcome to come and visit the exhibition. Entry is free.